How do you distinguish between memory, collective memory, and history? The only thing that we can call memory is individual memory. You can testify on the basis of your individual memory in a court, but not on the basis of your collective memory. Even if we agreed on what happened [in Charlottesville], that wouldn’t mean we have a collective memory; it would just mean we share the same view. Collective memory is the way that societies agree to remember the past. Collective memory is the way we think about history, but it’s not history. History is critical, or it’s nothing. Respectable historians don’t write history to serve the interests of the present. They write history to explain what happened in the past, not to tell you, “this was the bad guy, this was the good guy.” Collective memory is about building solidarity, about building community. It is about finding a way to reconcile with the past. That seems to be at the core of the question of these Confederate monuments. How do these ways of viewing the past relate to debates over monuments commemorating the Confederacy? There’s no such thing as a monument that exists in a value-free, opinion-free, politics-free, ideology-free context. We’re always rewriting our past, and when monuments are built they reflect a certain vision. A monument usually honors one side in conflict. Even in putting as uncontroversial a monument as one to George Washington, we’re saying George Washington was right, the revolution was right, and Tory sympathizers—the third of the American population that moved to Canada or back to Britain because they opposed the American Revolution—[were wrong]. There’s no such thing as a monument that exists in a value-free, opinion-free, politics-free, ideology-free context. When you have a tragic and controversial question like that of the American Civil War, that’s exponentially more difficult, and has to be thought through that much more carefully. These monuments to the Confederacy seem to defy the cliché that the victors write the history. What distinguished the American Civil War from so many other conflicts is that the victors didn’t build all the monuments. The Southern version of the past—that of a tragic war between brothers, a noble cause—became the national myth after the murder of Reconstruction. The federal government won the war, and the rebellion won the peace, in terms of the memory war. In a sense, the [U.S.] military ratified the victory of the Southern version of events in the memory wars by naming bases in the states of the old Confederacy, where there are a disproportionate number of military bases, after Confederate generals. The most important one is Fort Bragg, which was named [in 1918] after General Braxton Bragg, who fought to allow the South to secede and remain a slaveholding polity. [It is the] headquarters of the airborne forces and Special Operations forces, which are fighting most of our wars. It’s paradoxical because in many ways, the U.S. military is much better at race relations than the rest of our society, and in many ways their seriousness about confronting these issues should be a model for the rest of U.S. society. Does the political salience of these monuments wax and wane? There are [Union] monuments in the Northeast, above all in small-town New England, to those who fell in the Civil War. By the [mid-twentieth century], whatever power they once had, they no longer had, whereas the Southern monuments retained their power, first and foremost over African Americans. Black leaders made heroic efforts to remind people of what Confederate battle flags, the official flag of the Confederacy, and these monuments truly represented, but their voices were largely unheard. People have realized these are not innocent objects of contemplation of the past. It was only when Dylann Roof, who clearly expressed Confederate views, murdered [nine congregants of the Emanuel African Methodist Episcopal Church, in Charleston, South Carolina, in June 2015] that there was serious support outside the African American community toward bringing battle flags down from the statehouse domes and all the rest of it. Now, after Charlottesville, the thing has gone viral. 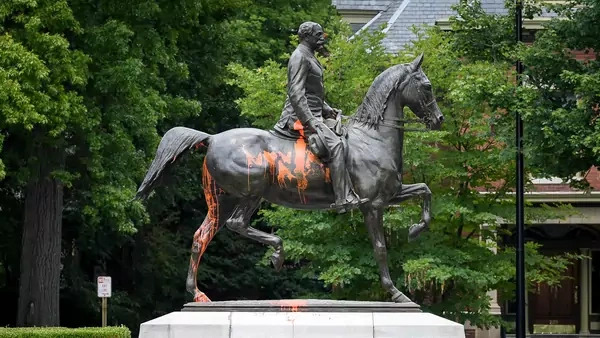 Cities are removing these statues, partly just in the name of public order but partly because people have realized these are not innocent objects of contemplation of the past, but powerful ideological statements that many, many Americans find hateful. The periods during which these monuments were built seem to say at least as much about the politics of the moment as about the period they’re commemorating. There were a great many monuments to the Confederate war dead and to Confederate generals erected between 1865 and the beginning of the First World War for us, in 1917. A great many more were erected during the civil rights struggles that began with [President Harry S.] Truman’s integration of the Army and the strike of the railroad porters in the forties, and then going through the great battles over segregation in the fifties through the early sixties. These monuments kept getting refreshed in the states of the old Confederacy and given new life and used for different purposes, whereas the power of the monuments in the North to command political allegiance, to have moral authority, fell into dissimilitude. Have you seen examples from conflicts abroad that might inform how the United States addresses these issues? If one side wins a war completely—there is unconditional surrender—at least in theory it can impose a version of the past. The Germans transformed their understanding of their own history [after World War II], but that was only possible because they were crushed and the victorious [Western] allies decided that they weren’t going to put up with any compromise over the understanding of just how evil Nazi Germany had been. As an occupying power we were able to impose an anti-Nazi view, which post-occupation German leaders on both the left and right [embraced], so generations of children have grown up with an accurate account of what happened. It would be inconceivable that contemporary Germans would accept the idea of a Fort Rommel [named for the field marshal of the German armed forces in World War II], or that the German military or political elite, right or left, would propose it. But imposing memories can’t work when there’s no prospect of a victor; most wars do not end in total victory. In Northern Ireland and in the Balkans [in the 1990s] there was no way of imposing one version of the past. They had to agree to disagree; you’re not going to convince either side for the foreseeable future of a version of the past that holds [itself] at fault. Lots of Irish people would agree that it’s better either to forget or to be silent. Since the German example is one of total victory, could it offer an analogy for the U.S. Civil War? The Germans were first forced and then themselves chose to write their history in a way that reflected a rejection of evil. We did the opposite after our Civil War. We could have done exactly as the Germans did, but we chose not to, and now we’re paying a steep price for that. We would have had to take seriously what [President Abraham] Lincoln thought [about the] purpose of the war. It might not have begun as the emancipation of black people, but that was the cause for which the second half of it was pursued. Since that hadn’t been established fully in wartime, it needed to be continued in peacetime. But Hayes comes into office within a little more than a decade of the end of the war, and the Reconstruction, which was meant to impose a different political system on the South, was halted, and the South was allowed to go back to what amounted to apartheid. Presidents were not willing to fulfill the promises of the Emancipation Proclamation, which should have included preventing revival of the Confederate view of the world. By the twentieth century, there were presidents who were absolute racist segregationists. Woodrow Wilson undid the moral progress that Teddy Roosevelt had made. Wilson tolerated the Ku Klux Klan so much so that he had a screening of a movie glorifying the Klan, Birth of a Nation, in the White House. Far from a federal effort to undo the Southern version, by the time you get to Wilson’s presidency there was actually a federal effort to confirm the Southern version. Can war memorials be compatible with a pluralistic liberal democracy? Some things cannot be fixed. This is something that can be fixed. Monuments listing the names of the dead themselves are acceptable by any moral yardstick; that is the genius of Maya Lin’s Vietnam War memorial in Washington. [Memorializing] Confederates who were ordinary soldiers and noncommissioned officers who died seems to be fine. The ethical problem is glorifying the cause. Monuments to the leading military lights of secession, or to the glory or the memory of that state, should be perceived as a rebuke to our conscience and to the history of our country and taken away. Some things cannot be fixed. This is something that can be fixed.